I got a whole batch of awesome art supplies for Christmas, so I guess I must be very loved or something… Well, the truth is I ordered them myself and then got my mom to pay and give them to me. I pretended the surprise, but not the happiness. Art Supplies is the gift that keeps on giving you know. 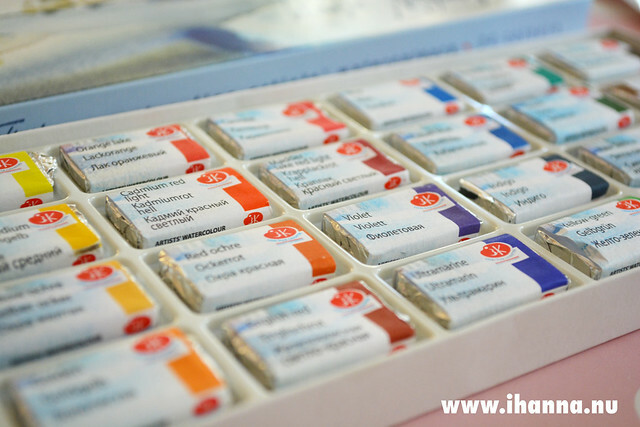 I got a new box for my old watercolors, a pad of square watercolor paper, two sets of paint brushes and one of the best things was a whole set of 24 artist watercolor pans. Hallelujah! I have never owned a whole new set like this before so just opening each of the “candy bars” got me extremely excited. 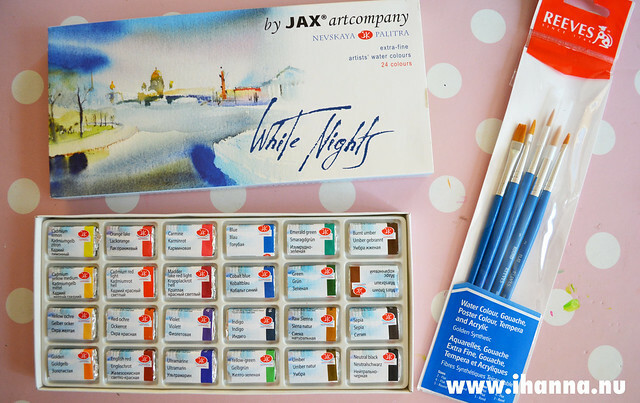 It was like 24 tiny gifts inside a big package… The brand is Russian and called White Nights, and they are really nice. I have only bought small half pans before, one by one when in need of a refill. Sometimes I even bought those tiny half pans just as a gift to myself. Then when I got home I just play with a new color. But in this pack – 24 new colors just for me. What happiness! It makes me wonder why I didn’t splurge on or wish for something like this ages ago… Things like this is really the best gift a creative person can get. 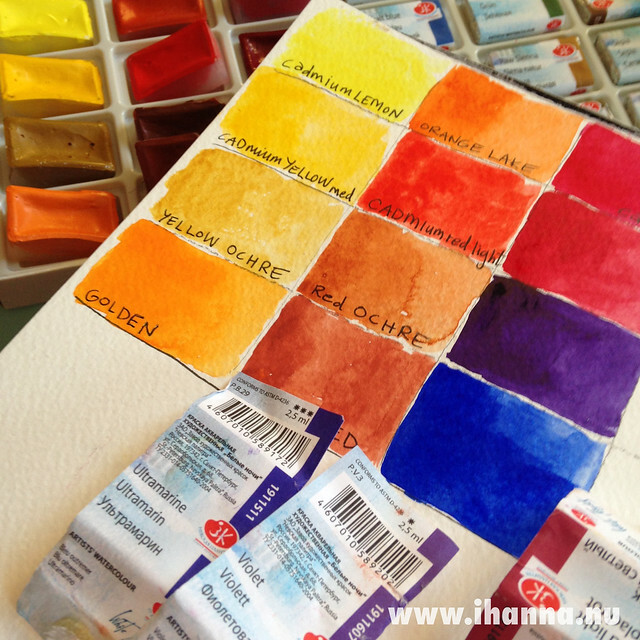 I decided to paint color swatches as I opened the White Nights Watercolors up, and note the names of each color. I wanted to try them out at once and it’s good to have the swatches with names in case I want to refer back to it later. 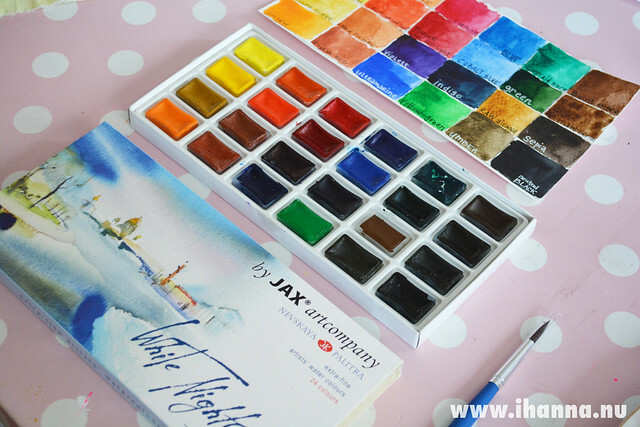 I am not an expert, but I must say I do love how pigmented and lovely these watercolors are. Now all I want to do is experiment with these colors and make little puddles of water and paint on paper. As with everything, there is pros and cons to buying a whole set like this. These are not too expensive, and buying them as a kit saves money. But then you also get a range of color that you might not use as often. Since I don’t sketch and paint from life/nature I doubt I will use up all these umber, sienna and browns in my lifetime. Also, there wasn’t a pink in the box (though the purple one was a fun surprise). But all in all, I’m a fan of White Nights so far. 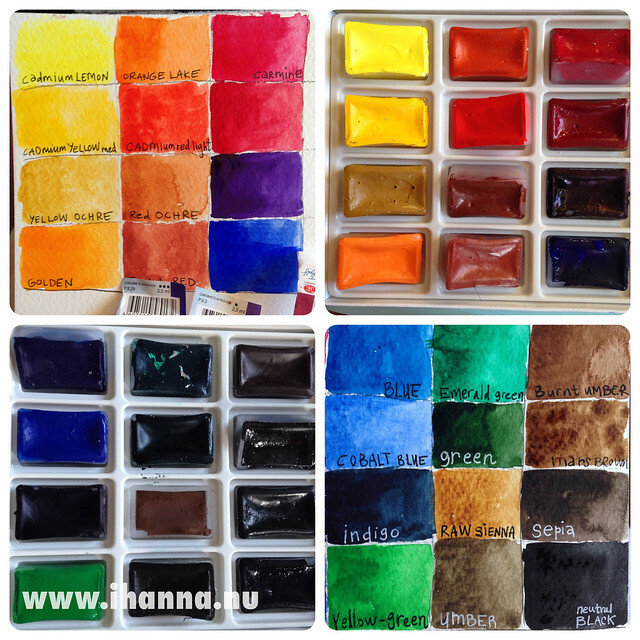 And I noticed that the swatches are really helpful when I’m painting, since many of the colors look almost black in the box, so it’s easier to take a look at the painted swatches when I want to pick the right color. Watercolors was my first real art love, I think, and they continue to be a favorite medium. So as I’m sure you’ve already figured out, I was like a kid at Christmas when I got these… For realz. 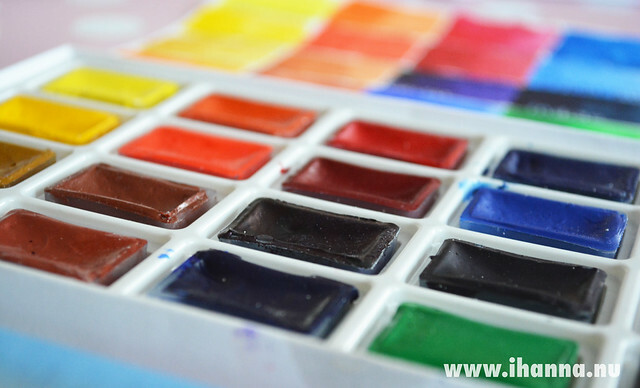 Click here to see how I sometimes play with watercolors. 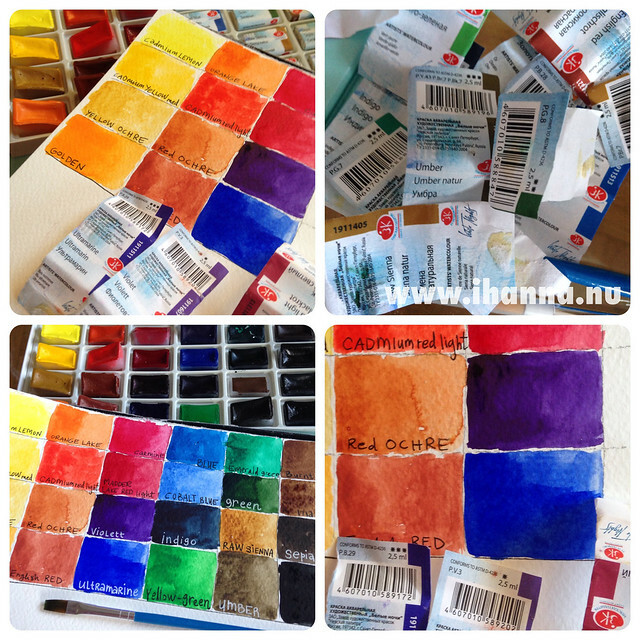 This entry was posted in A Creative Life and tagged awesome supplies, colour swatches, exploring colour, new material, product testing, watercolours. Bookmark the permalink. Gorgeous! Merry Christmas, to you! They look like delicious chocolates all wrapped up! I agree that a color swatch is a very good idea. I look forward to seeing what you create with your new colors. What a great present — i love to get art supplies as gifts too. And they do look like wrapped up little (eye) candy as someone commented. Have fun creating! I was going to go and do some sewing but now . . . I’m not so sure. And your mother is a darling. I saw your new set on Flickr and thought “Oh, what fun!” Enjoy!!! jag spenderade mycket av mina födelsedagspengar på målargrejer, däribland den minsta lådan med white nights akvarellfärger – på senaste tiden har jag verkligen velat lära mig måla akvarell. men nu när jag ser din färglåda, så påminns jag om att jag helt glömt bort mina akvarellfärger… alltså dags att plocka fram dom, och lära känna dom!